When you’re making stocks, gravies or soups from scratch, or want to save roast pan juices for immediate use and you don’t have time to refrigerate the liquid so that skimming off the solidified fat from the top is easy, you will need a fat separator to do this quickly and without making a mess. It also works great if you have a farm with cows that give you milk, as it can separate the milk from the cream. Our best fat separator reviews have selected from the best models on the market so that you can quickly pick one that works best for your needs. Before we go into which gravy and fat separators come out on top, you should first ask yourself what is the best fat separator for your needs. Although you may find that most times a 2 cup model will work well, you don’t want to suddenly have to strain a big pot of liquid in two batches just because your everyday one is too small. Keep in mind that when roasting a turkey for Thanksgiving you’ll get a large amount of juices that you can use to make gravy and maybe even refrigerate some for later use. A good 4 cup model should be able to handle and separate fat from even one cup of liquid and you’ll have lots of broth for most needs. All fat separators work on a basic scientific principal, which is that fat floats above water. Fat separators use either a pitcher type design (which resembles a garden watering pot) or a bottom drainer, which has a body and a hole at the bottom with a plug that allows draining. You use these models differently but they’re both very effective. Both types feature a clear glass or plastic container with measurement markings down a side and a strainer lid on top. You pour your stock or pan juices through the strainer, which catches all the aromatics and only lets the liquid through. After waiting for just a few minutes, you can clearly see the fat collected in a layer above the clear liquid. With the first type of separator, a spout starts from close to the bottom of the pitcher so that when you tilt it, only the clear liquid will pour out, which you can collect in another vessel. You stop pouring when you see that the fat layer has almost reached the level of the spout. The second type of grease separator has a mechanism by which you release a plug from a small hole in the bottom of the holder to let the clear liquid drain out into another container. You can watch the fat level slowly drop and when it almost reaches the bottom, you re-plug the hole to prevent that from also draining. Both types of fat strainers have their fans but the pitcher kind may be harder to use for some, as it can be tough to prevent at least some fat from entering the spout when you start pouring the stock in and when you’ve almost reached the last of the clear liquid. To prevent the first problem, the design can include a spout stopper that creates a small vacuum at the bottom and prevents the fat from flowing into the spout while you fill the pitcher. To prevent the second problem, you may have to sacrifice the last bit of clear stock that’s right under the fat layer. A good model should leave minimum wasted stock. The bottom drainer type of model just needs you to keep a close eye on the layer of fat as it moves towards the bottom with the the clear stock draining out. You just need to plug up the hole as soon as the broth has almost all drained out. However, a cheap model may have a flimsy plug mechanism that can break after several uses. Regardless of the type of separator you choose, make sure that the strainer mouth is wide and that it has a high lip so that the stock doesn’t splash and spill out when pouring. However, the strainer lid should not take up any part of the stated capacity, as some models do. The holes in the strainer should also be large enough that the liquid drains through quickly. Otherwise, you have to pour too slowly to prevent it from spilling over the edge. While using a fat separator, the handle should be large enough that it doesn’t slip, as this will probably cause the fat to mix with the clear liquid. Since most recipes call for an exact amount of stock for making gravies and soups, the markings along the side of the fat separating measuring cup should be clear and accurate and should not rub off over time. Fat and oil is not easy to clean and the spout in a pitcher separator is very hard to clean if you don’t have a fine bottle crush. It is also helpful to clean the hole in a bottom drainer. If you don’t already have one you should get one, but some separators some with one as a set. Finally, the container should be able to withstand boiling liquids without cracking, and if it is supposed to be dishwasher-safe, then it shouldn’t warp after several cycles. The 4-cup OXO Good Grips is a pitcher style fat separator that’s the most popular in its category. The OXO’s spout is a lot like that of a watering can and has a tapered lip to make it easy to pour the separated stock out into another container. A spout stopper prevents the fat from entering the spout when the pitcher is being filled. The OXO Good Grips fat separator is solidly built of BPA-free heat resistant plastic, which is important, as some fat separators have been known to crack. This model has a strainer with a splash guard, which strains out the unwanted aromatics as the liquid is poured into it while preventing burns. It features a non-slip handle for easy pouring and you get ounce and millilitre measurement markings in red along the side that are easy to read. Dishwasher safe, the OXO is known for it’s durability. No fat strainer spout is ‘easy to clean’, and usually small bottle brushes are used. If you don’t have one, you can buy the packaged set that comes with a suitable brush and a turkey baster. Those customers that have got a handle on how to use a fat separator like this say that it works like a charm and one said that only about a tablespoon on broth is wasted just below the layer of fat. The 2 cup OXO model boasts the same features, but in general, a larger fat separator is preferable over a smaller one, due in part to safety (from splashing, etc.,) and in large part to versatility. The OXO runs true to size. 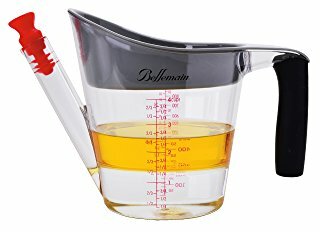 The title of Bellemain’s product also calls it a measuring cup with fat strainer capacity. It’s marked both in metric and standard measure on one side, although the markings are somewhat difficult to read. On the other side are markings for cup measurements with two different scales – in thirds and in quarters. Everything else about this Bellemain fat separator model is similar to the Oxo model above. However, the Bellemain’s construction, which is made of BPS and BPS-free Tritan plastic, feels lighter than that of the OXO, and the product may be less substantially built. The Trudeau gravy separator differs a bit from the above two models in that it is a lot like a measuring cup that separates grease. Staying close to the original design principal, the Trudeau pours through a spout that starts near the bottom, but instead of the design where it sticks out of the container, this spout is more like a channel built into the slope of the container. There is no plug here and the fat does enter the channel as you pour into the separator. However, because the bowl is squat and oblong, there is always a layer of clear liquid under the layer of fat even inside the channel, and only the clear broth pours out while the fat remains in the bowl. The strainer lid also acts as a blockade to the fat, as the opening underneath it is only enough for a thin stream of broth to flow out. It is recommended that you pour very slowly to ensure that no fat pours out. While this 34 oz (4 cups) separator takes up more counter space, it is squat enough to easily fit in the refrigerator if you want to allow the fat to harden a bit before pouring the broth out. This separator has measurements in cups and millilitres embossed in the microwave- safe BPS-free plastic so they won’t wear off. However, they’re a bit difficult to read because of this. The Trudeau’s pour spout is somewhat easier to clean than a pitcher spout, although the ridges may require brushing, and it is dishwasher safe. However, the placement of the spout may cause particles in the strainer, to pour into the liquid when the unit is not entirely full. A bottom release fat separator that few old timers would recognize as such right away, the Cuisipro separator has an unusual design that has proved very popular. The stopper, here referred to as a trigger, is remarkably easy to use, making this our pick for best fat separator. The bottom of the container has a hole that is plugged from the inside by a silicone plug. It is attached to a lever-type trigger situated on the handle and it lifts the plug when you pull down on the trigger. As soon as you leave it, the plug blocks the hole. The mechanism is very strong and won’t break even with constant use. It is very easy to drain most of the clear broth using this separator. The transparent BPA free plastic lives up to its claims of durability, it is dishwasher safe and is carefully numbered for measuring in metric or standard measurements, although the embossed markings can be hard to read at times. For a fat separator, the unit cleans easily. The Cuisipro’s filter is good for vegetable bits, bones and grizzle, and users use a chinois or filter to remove more particulate matter if it is necessary. The Swing-A-Way is a bottom draining fat separator that distinguishes itself by a spring release handle, a different approach to the above design of the Cuisipro. The comfortable rubber handle allows the cook to squeeze to release the plug that allows the liquid to drain, and to stop squeezing to stop draining. This is more ergonomic than pulling a lever. This separator is easy to control, easy to clean, and ergonomic. The BPA free plastic cup has both standard and metric measurements as well as cup measurements. Safety is key in the finishing points, with a deeper strainer allowing splash free pouring, and the carefully designed release handle. Unfortunately, the plastic rim at the bottom seems to be made of cheaper material than the rest of the container, as a few customers say that it cracked after a few uses and leaked. There’s a new contender in town for best bottom draining fat separator for gravy and soups, and that’s the OXO Good Gravy Trigger Fat Separator. It takes some of the best features of the two above models as well as its spouts-style OXO brother. It uses a handle squeeze trigger to block and unblock the bottom draining hole, however, instead of a plug that plugs into the hole, it has a small silicone tube that is squeezed shut to close the drainage hole. When you want the liquid to drain off, just release the trigger and the tube opens. This method gives you more control over the flow of the liquid, as you can squeeze just a little to narrow the tube opening and therefore reduce the stream without completely stopping the flow. This helps if you want to drain the stock straight into a dish that you’re cooking on the stove and want to do it slowly and steadily as you stir. The measurement markings are in clear red, like its brother, however the rim of the strainer lid is not as high, so you have to be more careful while pouring hot stock in. The strainer holes are smaller, so small aromatics like peppercorn can also be strained out.